One can liken the roof of a house to a lady’s hair—they’re seen as the crowning glory, worthy of attention and maintenance. A visually appealing, highly functional roof can add value to any home when it’s up for sale. However, the most durable or most appealing of materials will not stand very long with poor installation. It’s important, thus, to consult only with a licensed and reputable roofer in Palo Alto or nearby areas. RealEstate.com knows a thing or two about bogus contractors, as evidenced in this short excerpt from an article posted on the site. The National Roofing Contractors Association (NRCA) is in the business of helping homeowners choose established and licensed roofers within their community. 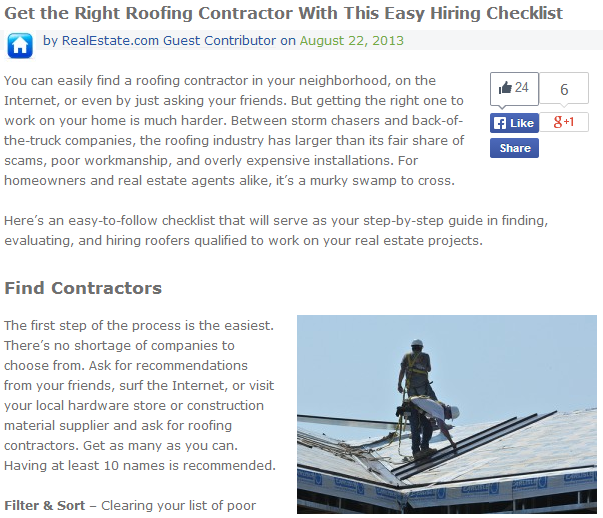 An FAQ section on the roofing page of About.com has published several tips taken from the NRCA on how to pick a reputable roofing contractor. Second, the contractor should be able to provide clear-cut cost estimates of materials, with adequate justification. For example, if a contractor presents estimates for an asphalt shingle roof replacement where the prices vary from other estimates, there is a good chance that something is amiss. Reputable roofers in Sunnyvale and other locales will give out realistic price estimates without sacrificing their guarantee for professional workmanship. Third, the contractor should provide warranties. There are warranties for different types of roofs, which the NRCA highlights in its consumer advisory bulletin. Most contractors offer workmanship warranties that typically cover installation and other related issues. If a roofer won’t offer warranties, it’s time to search for someone else. Homeowners have the right to demand workmanship and material warranties for their roofing projects. Any roofing project is a major investment, and there’s no better way to ensure top-quality service than enlisting the help of a professional roofer like Shelton Roofing.